It has a ton of features and I have not had the chance to use and learn the vast majority of them. But I learned one thing so I’m going to share that particular implementation: reconciling spelling differences in data. The data that I worked on: a few worksheets having bus stop names from BRT & Non BRT Route Details & Bus Stop LatLong.xls from Pune Open Data Portal. I’ve written a detailed log of the whole (incomplete) exercise here, but I’ll expand on just the OpenRefine part. Apologies if any of this gets confusing.. just see the screenshots! 1. All the names that need reconciling are brought under one column. Other columns are kept to track serial numbers, etc. If two or more data tables are involved then a combined table is created carrying columns from all the tables, and one more column is made to disambiguate which sheet the row is from. 2. 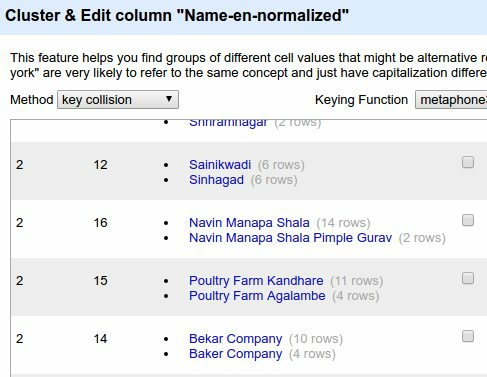 A copy column is made of this names column in the same table. Just in case we screw up and need to revert. Always make backups! 4. Now we see the table laid out. There are drop-down arrow buttons on each column heading leading to menu of actions to do on that column. Locate the Names column you want to work on and open its menu. 5. First things first: clean up the cells by trimming leading and trailing whitespaces. 7. Consider first listing as example. ‘Pune Vidyapeeth Gate’ has 3 different spellings spanning 63 rows. If we click on one of the spellings, it appears under “New Cell Value”. We can even type a whole new spelling. Select the checkbox under “Merge?” and press the big button at bottom “Merge Selected & Re-Cluster”. 8. What happens in the background: The rest of the table stays as-is. But these 63 cells are over-written with the single new value. 9. So in two clicks we have done what normally would be a very long process in excel of filtering, sorting, copy-pasting and restoring to original order. 10. Here is a saved diff check on diffchecker.com that shows on left my original list and on right the normalized list I got through OpenRefine. 11. Do explore the various other options on the page. For bringing similar-spelling words together, certain linguistic algorithms are used (apologies but I haven’t bothered digging deeper into them), and there are multiple options, seen at the top of the last screenshot (“Method”, “Keying function”). Depending on your data one way may work better than the other. 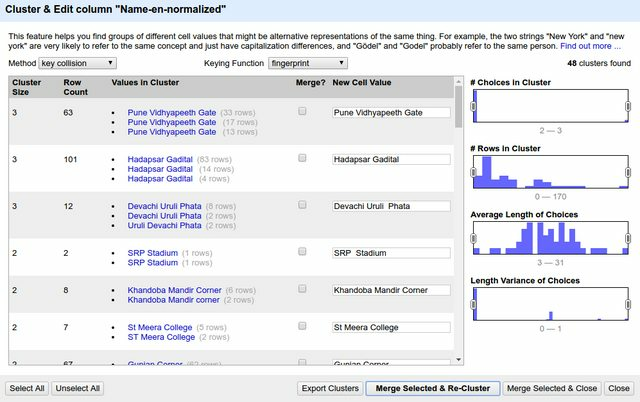 You can do one run of clustering / normalizing and then choose another algorithm that might cluster in another way. There will be false positives too (ie names that are supposed to be different only but the program thinks they should be same) and you can ignore them by keeping their “Merge?” checkbox off. 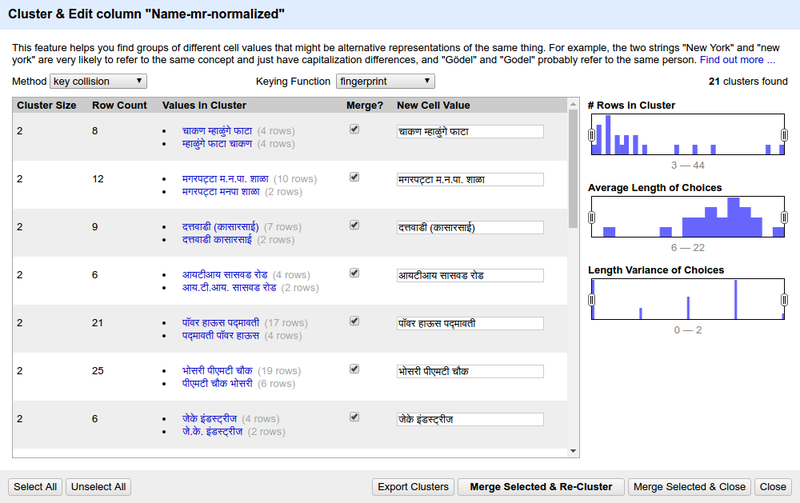 It does marathi names too! So that’s it for this walkthrough. Gratitude to DMer Aravind from Bangalore for insisting I check out this tool when I was saying “it’s ok I’m doing it in excel”. 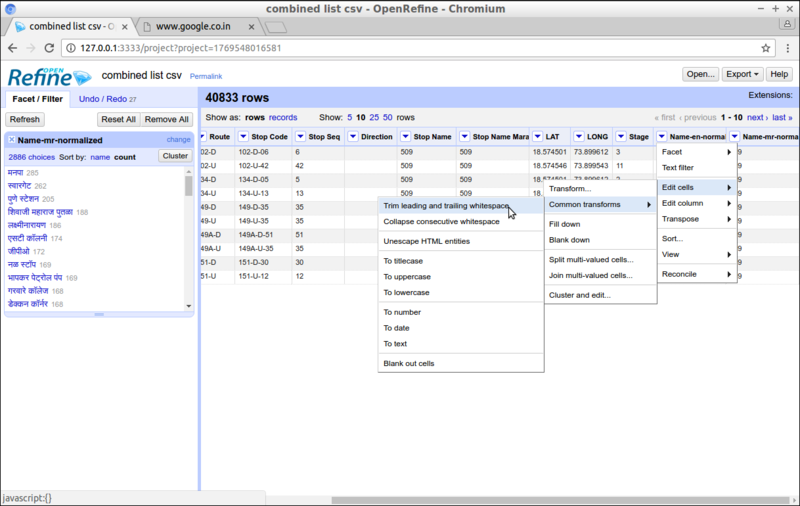 Have you used OpenRefine too? What was your application? Do share here or drop me an email on nikhil.js [at] gmail.com. OpenRefine.org – main page has good videos to get you started. Open Bangalore has been a pioneer in opening up several data sets that help understand Bangalore city. This includes the network of Bangalore Metropolitan Transport Corporation (BMTC). The BMTC operates over 2000 routes in the city and region of Bangalore and is the only real mode of public transit system in the city. Some of us at DataMeet took to time understand its network better by performing some basic analysis on the gathered dataset. The data set had bus stops, routes and trips. We inspected frequency, coverage, redundancy and reachability. BMTC is known for its many long routes. Route 600 is the longest, making a roundtrip around the city, covering 117 km in about 5 hours. There are 5 trips a day, and these buses are packed throughout. It should be noted that while the route traces the edges of the city in the west and north, it encircles the larger industrial clusters of the east and south. View the map full screen. Next, I wanted to look at the frequency of different routes. In the image below, stroke thickness indicates how many trips each route makes. The relationship of the bus terminals with neighbourhoods and the road network can be easily observed. For instance, the north and west of the city have fewer, but more frequent routes. Whereas, the south has more routes with less frequency. Also, nodes in the north and west seem to rely more on the trunk roads than the diversely-connected nodes in the south. One can easily trace the Outer Ring Road, too. I tried to define reachability as destinations one can get to from a stop without transferring to another bus. The BMTC network operates long and direct routes. 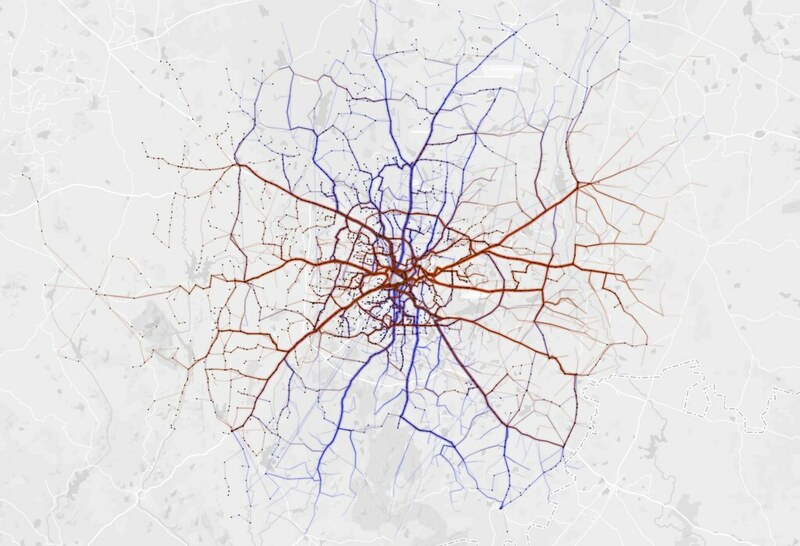 The map shows straight lines between bus stops that are connected by a single route. The furthest you can get is from Krishnarajendra Market (KR Market) to the eastward town of Biskuru: roughly 49 km as the crow flies. BMTC routes are classified into different series. Starting from 1 – 9 and A – W. I analysed coverage based on series 2 (blue) and 3 (green) and they make up almost 76% of the entire network. 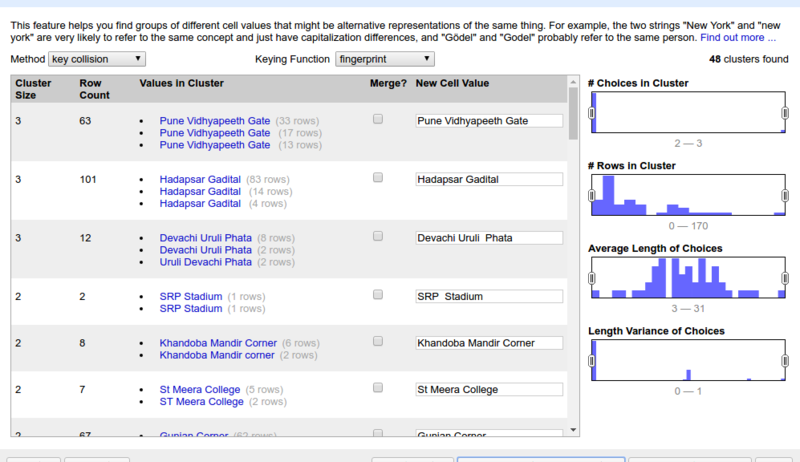 Tejas and I took turns to try and figure out the redundancy within the network. Redundancy is good to absorb an over spill of bus commuters. Redundancy is a drain on resources and makes it hard to manage such a vast network with efficiency. So, we looked at segments that overlapped different bus routes. 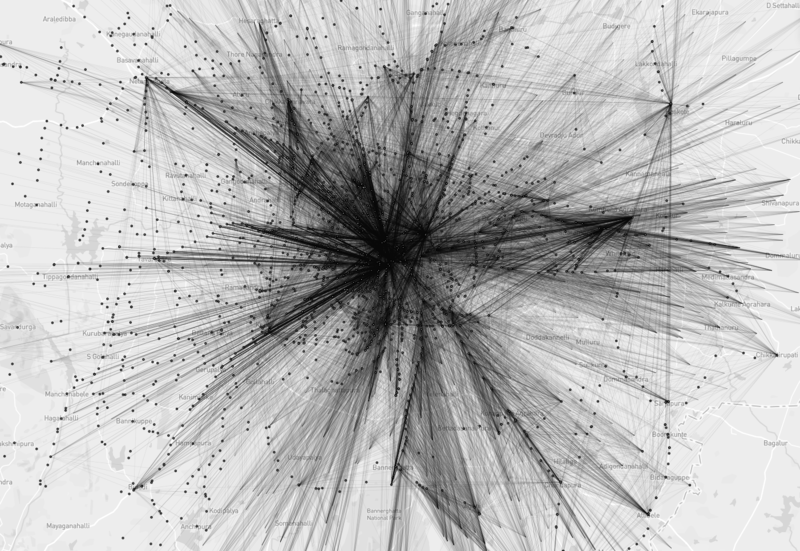 This map by Aruna shows node strength – number of routes passing through a particular stop. You can see that the strength decreases as we move away from the city center with the exception of depots. 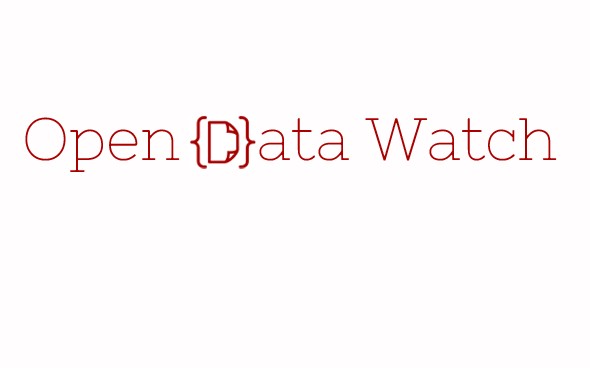 Just like the data, our code and approach are open on Github. We would love to hear from you, and have conversations about the visualization, the BMTC, and everything in between! Mobility is one of the fundamental needs of humanity. And mobility with a shared mode of transport is undoubtedly the best from all quarters – socially, economically & environmentally. The key to effective shared mode of transport (termed as Public Transport) is “Information”. In India cities, lack of information has been cited as the primary reason for deterrence of Public Transport. Transport Agencies are commissioning Intelligent Transport Systems (ITS) in various mode and capacity to make their system better and to meet the new transport challenges. Vehicle Tracking System, Electronic Ticketing Machines, Planning & Scheduling software are all engines of data creation. On the other side, advent of smart mobile devices in everyone’s hand is bringing in new opportunities to make people much more information reliant. But the demand for transit data is remarkably low. The transit user and even transit data users like City Planners should demand for it. To make operation and infrastructure data of Transport operators easily available as information to passengers in well defined order to plan their trip using available modes of Public Transport. To make transit data provided by multiple agencies for different modes (bus, metro, rail) usable and make multi modal trip planning possible. To publish transit oriented data in standard exchange format across agencies in regular frequencies to provide comprehensive, accurate and updated data for study, research, analysis, planning and system development. To be a part of Passenger charter of Transport Operators to publish their data in standard format and frequency. This can also serve as a guideline for Transporter Operator while commissioning any system like Vehicle Tracking System, ITS, Passenger Information System, website etc. 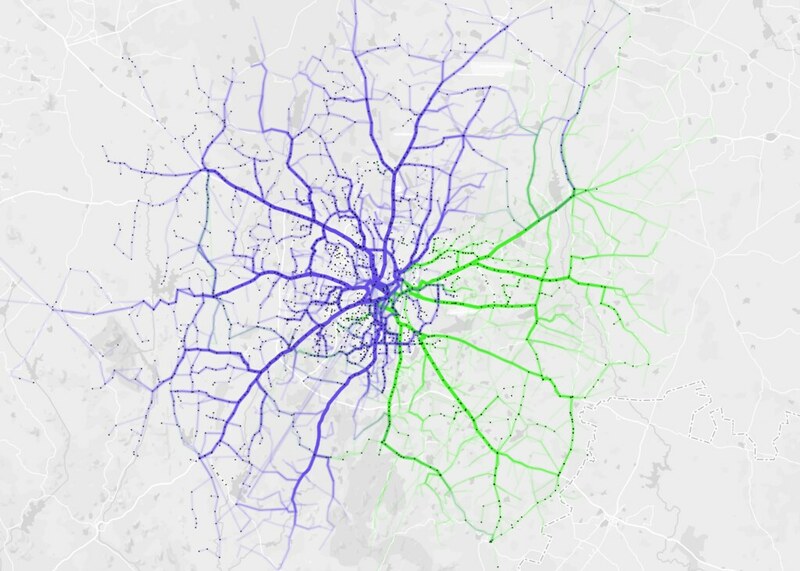 What kind of Transit data is needed ? 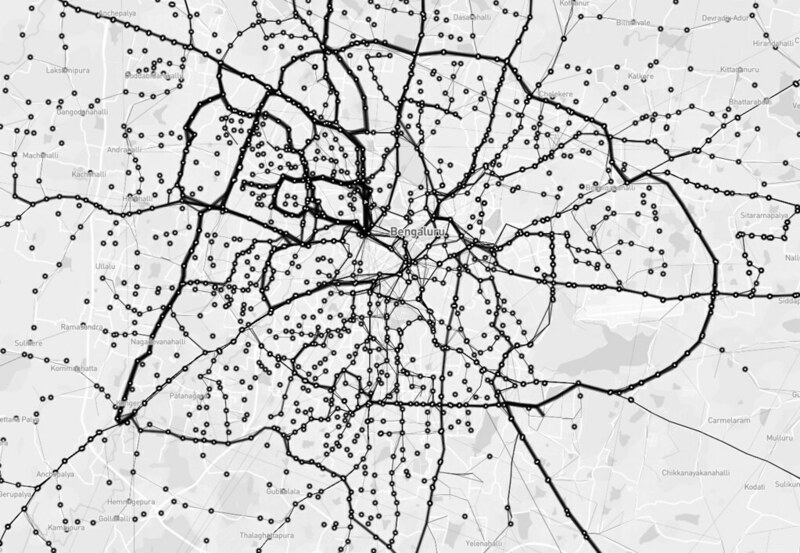 It will comprise of data on bus stops, stations, routes, geographic alignment, timetables, fare charts. With this dataset, general information on transit service can be easily gathered to plan a journey. Trip Planning mobile apps, portals etc can consume this data to provide ready and usable information for commuters. A commuter is driven by lot of anxieties when they depend on public transport mode. Some common queries; “When will the bus arrive ?”, “Where is my bus now?”, “Will I get a seat in the bus ?”, “Hope the bus has not deviated and not taking my bus stop.”. Answer to all this queries can be attended via real time data like Estimated Time of Arrival (ETA), Position of the vehicle, Occupancy level , Alert and Diversion messages etc. Transport Operator equipped with Tracking systems should be able to provide these data. A Transport Operators operational data comprises of ticket sales, data of operation infrastructure and resources like Depots, Buses, Crew, Workshops etc. As operatore are tending towards digital mode of managing these data it also makes a good option to publish them at regular intervals. A general commuter might not be interested in this data, but it will very useful for City Planners to analyse the trend of commute in the city and make informed decision. City transport infrastructure can be planned to orient it towards transit needs and demands. The transport agency can benefit highly by demonstrating accountability and transparency. They can uplift their image as a committed service provider thereby gaining for passengers for their service. So, together it will make a thriving landscape, if the data creators of Public Transport in India provide their data in Open which can be consumed by a larger set of people to build platforms, applications, solutions for transport study, analysis & planning across different section of users. 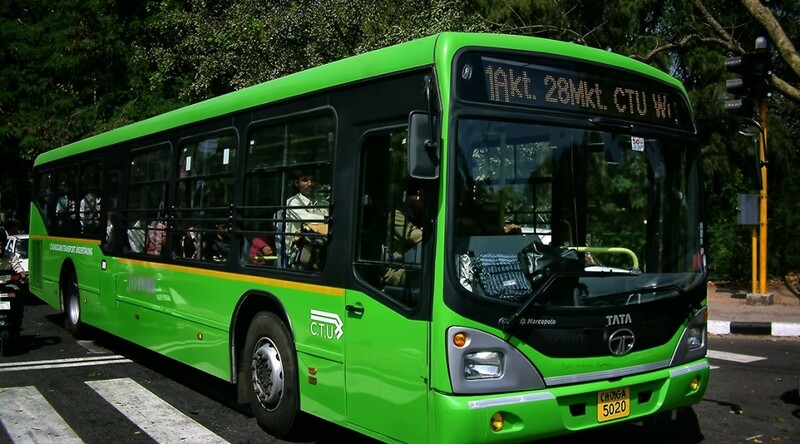 Open Transit Data is the tipping point for Smart Mobility in India. That is why we have started putting our thoughts together and began writing an Open Transport Data Mainfesto. 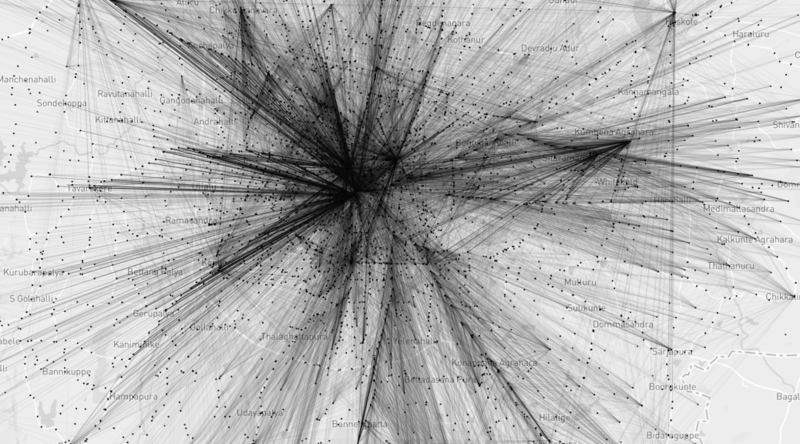 View Open-Transport Data Manifesto on Hackpad.